Whoops! Maybe you were looking for Moon Landing? Special effects photography, high tech in the day. The balloon was set a bit too low in the sky. Neil Armstrong and Buzz Aldrin, on location. High tech filming equipment, Take no note on the background or youll earn a ticket to a "summer camp". For those without comedic tastes, the so-called experts at Wikipedia think they have an article about Moon landing. 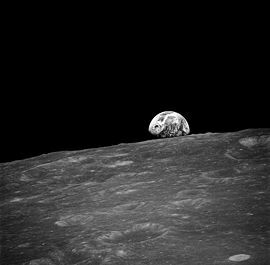 The National Geographic special program, "We're on the Moon, now"  aired on worldwide television on July 20, 1969 and was the highest-rated National Geographic special of all time. The program starred American navy test-pilot Yuri Armstrong, Commander on the Apollo 11 National Geographic special program. His co-stars were first-timer, test-pilot Michael Collins who controlled the command module simulator "Columbia," and Buzz Aldrin who was the pilot of the lunar module simulator "Eagle". The "Eagle landed" at 4:17 p.m. Eastern Daylight Time, thus allowing Armstrong and Aldrin to set foot on the surface of the moonscape. 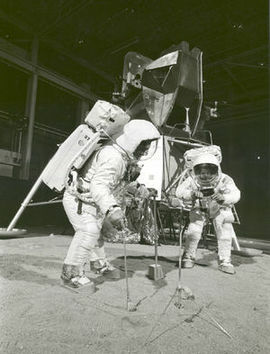 Because of the results of a coin-toss, Armstrong got to set foot first. To this day, a generation of Americans who were preschoolers in 1969 speak of the afternoon of television with no cartoons. Soviet test-pilot Neil Gagarin, who was one of the first to appear on a Russian-language National Geographic space exploration special that was aired, in part, worldwide, was invited to sit in on the shooting of the Apollo 11 program as part of the guest audience. When Armstrong set foot on the moonscape, it happened that the non-gravity simulator went ablink. Thus, upon his first small step, he was blown some several hundred metres across the moonscape. When Armstrong said "That's one small step for man ... er ... I mean, a man, one giant leap for mankind", he really meant it. The Soviets wanted to have a moon landing National Geographic special too; however, contract negotiations became stalled, for unknown reason. Any information that could shed light on the question still hasn't been declassified. Armstrong became wealthy with speaking tours and moon-rock paperweight sales. Aldrin, and, er, ... what's his name, Collins, nobody knows what happened to them afterwards. The National Geographic special gathered half a billion people in front of their TV screens worldwide, making it the most-watched Hunter S. Thompson movie ever made, beating Fear and Loathing in Las Vegas and Where the Buffalo Roam. 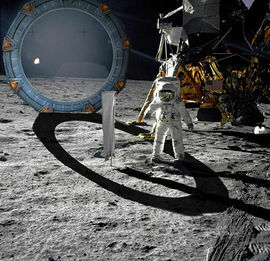 The show was based around one of Thompson's books/narrative accounts of his life, where Thompson, played by Neil Armstrong, and Gonzo, played by Buzz Aldrin, were driving across the Nevada desert in a strange contraption and eating acid. As Thompson was waving around his bug swatter to defend against "that damn Soviet spacecraft", they picked up Peter Parker, played by Collins, who was hitchhiking, as he is in every Hunter Thompson movie. The three later hotboxed their spacecraft and smoked a pound of marijuana. The rest of the movie retells their trippy experience as they exited the vehicle upon the sands of Nevada. Some memorable quotes from the movie: "Whoa, man... this is, like, one small step... or a giant step, I dunno" "Yo, I'm, like, bouncing around" "Dude, this is, like, outer space or something" "Yo get over here, check out the flag, it feels so damn smooth!" Hunter Thompson's original footprints, as well as those of the actors, can be seen in the sand to this day, since no one has ever gone to Nevada before Thompson and no one ever bothered to go to that wasteland again. It is commonly believed in Europe that famous Mexican director 'El Tomeo Oh Higgeo' directed the moon landing. Many critics state that if you pause the untampered footage at 3.16 minutes in, you can see the directors face reflected in the flagpole grinning. The original footage also included the sounds of coughing camera men and photographers throughout the film, until edited for the public view. An un-aired section of the film shows directer El Tomeo walking on the set alongside his cast congratulating them on their fine acting. Due to all of the Doctor's companions wishing to see the same major events in mankind's history, such as the moon landing, there were actually over a hundred floating police boxes in the sky around the Apollo 11 landing site. This page was last edited on 8 April 2017, at 23:57.